The Future of Work – Seminar with professor Richard B. Freeman at Medelhavsmuseet, Stockholm, October 14, 2013. This was the first in a series of seminars entitled ”The future of …” and organized by Stefan Svallfors at the Institute for Futures Studies. Richard B Freeman from NBER and Harvard University made an introductory presentation entitled ”The Paradox of Increased Team Production and Greater Inequality in Pay in the Knowledge Economy”. Author and journalist Göran Rosenberg moderated the seminar, and Lena Sommestad and Åke Sandberg commented upon Freemans presentation. The increasingly collective character of advanced production conflicts with the desire to identify superstars and give huge rewards to winners. Richard Freeman will in this seminar use the work of scientists, engineers and academics as a prime example, as well as of executives discussing this paradox. He will also discuss the questions of who ”owns” results, and of how we deploy new technologies, alongside issues of the global division of labour. For those interested, there is abundant documentation available from the seminar. Below find links from the programme aired by Swedish Public Television (UR), as well as recordings published by the Institute for Futures Studies, both video and audio. Here I will try and summarize neither Richard Freeman’s introduction nor Lena Sommestad’s and my own comments and the final discussion. I will only in retrospect share a brief reflection on my own comments. A background for me was our book Nordic Lights (SNS förlag 2013), with some of the themes summarized in Swedish in an opinion article (DN Debatt July 11, 2014). Our comments to the interesting and empirically rich powerpoint presentation that Freeman delivered had to be somewhat spontaneous. Here I try to make mine somewhat more systematic. Freeman’s main thesis is stated already in the title of his presentation, ”The Paradox of Increased Team Production and Greater Inequality in Pay in the Knowledge Economy”. Another way to express a similar thesis would perhaps be the classic idea of a growing contradiction between the increasingly social or societal character of production technology and organization and the more unequal and indivualized pay and remuneration systems. Freeman talked about rising inequality in the US, and the importance of rentseeking as an explanation to the contribution of top executives to economic efficiency. Freeman also brought up economic feudalism, referring to Eisenhower’s Military-Industrial Complex speech from 1961 he pointed at close relations politicians and companies (funding); lobbyists and the media; and new possibilities in ICT and ”citizen science” and a new transparency. In my comments I focussed on the main theme in Freeman’s talk: team production and inequality. I especially discussed the concept of ”team”. On a conceptual level, ”team” may mean very different things. I have been interested in the automotive industry, the car industry. Group work was discussed and developed in the 1960’s, based in Tavistock and a Norwegian sociotechnical school, and introduced in Sweden not least in Volvo (as discussed for instance in my edited volume Enriching Production.) ”Sociotechnical group work” was a concept impregnated with competence, cooperation and union influence and related to democratization in companies and in the economy at large – against a background of a tight labour market, generous welfare benefits and a general political radicalization. Later team work came to Scandinavia through Japanese experiences and above all the US interpretation through the MIT Lean production project. In some countries this meant a new focus on teams and cooperation. In Scandinavia it rather meant a tightening up and stricter control of already existing sociotechnical groups that became more narrow teams. This is to say that team or group work may be very different things, so to be able to say that individualized pay is a paradox when there is team work one presupposes that team work has a genuinely social character, and my view is that team work in general does not have a social character, but perhaps sociotechnical group work has. And what is spreading today seems to be team work. Also we see very different types of team/group work for different types of employees, a group of researchers or qualified consultants work in groups that are very different from teams at McDonalds or a call centre for instance. More generally, in Sweden, there seems to be a tendency of polarization of qualifications with a recent growth of less qualified low wage jobs and at the same time growth of the best paid jobs (Rune Åberg in Ekonomisk debatt). And some of the jobs – at both ends – may be some kind of team work or group work. Perhaps more team work at the lower end and group work at the upper end? It seems as if much of team work is hierarchically organized and controlled in a detailed way, hindering local, egalitarian cooperation at work, and not very collective and social in character and thus not in contradiction to unequal and individual pay. A colleague, sociologist and former HR director at Volvo Cars, Anders Boglind, writes in Nordic Lights about Ford taking over Volvo and the changes this brought about in the character of work and management. Boglind uses words for Volvo like: Decentralization, trust, dialogue, local patchwork. And Ford: Centralized, formal control, uniformity, audit, technical procedures. We probably see different types of work organization and of group/team work, in different countries and varying over time. Most of Freeman’s examples and figures are from the US. An interesting topic would be the relation between on the one hand macro ”societal models” with various degrees of inequality and of general trust, and on the other hand type of group work. In our Nordic Lights we discuss concepts like ”productive justice” and ”solidaristic individualism” as a framework for understanding the organization of work, and of management. The Nordic models are often characterized as having a comprehensive welfare state, labour market institutions developed over a century long process (with strong parties negotiating), low level of inequality (but growing), trust and a positive view of technological change. Probably such characteristics are essential for the implications of group work and its relation to remuneration. For example trade union density in the US today is 11 percent, and in Sweden around 70 percent and about 90 percent of employees covered by collective agreements. On such a more general note, talking about ”the future of work”, I think broader themes are essential like the weakening of trade unions, growing unemployment, more unsecure employment conditions, growing inequalities in pay and fortunes, the changing character of work with boundaryless and less regulated work putting the individual worker directly ”at the mercy” of not only managers using new techniques and ideologies, but also customers and markets. Flexibility is a catchword but there is a growing imbalance between the flexibility that is forced upon the employees, and flexibility that would mean that employees choose when and how to carry out their work and how much and how intense. ”I dag är vi beroende av att arbeta tillsammans med andra för att nå resultat, men vi blir belönade som individer. Det är en märklig paradox. Det säger Richard B. Freeman, professor i ekonomi vid Harvard University. Under sitt föredrag utvecklar han sin tes som sedan kommenteras av Lena Sommestad, socialdemokratisk riksdagsledamot och professor i ekonomisk historia, samt Åke Sandberg, professor emeritus. 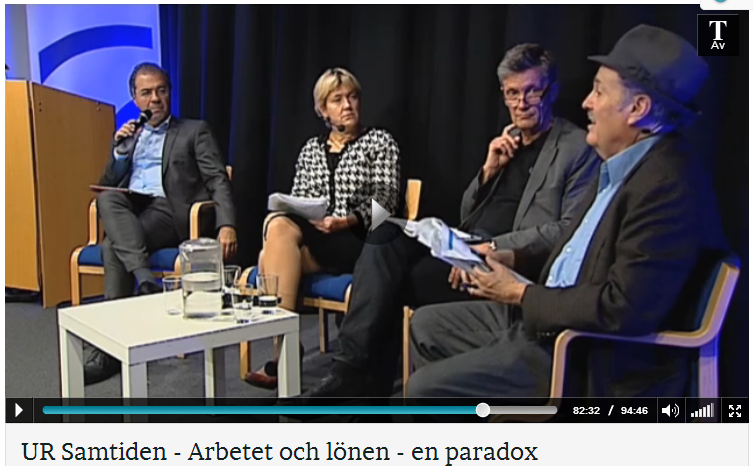 Moderator: Göran Rosenberg. Inspelat 14 okt 2013. Arrangör: Institutet för framtidsstudier.” The programme will be available for streaming for a couple of years.